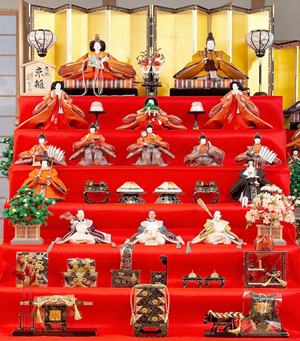 The Hina Matsuri (Doll Festival) is coming up on March 3. 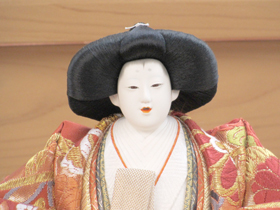 Also known as the Momo no Sekku (Peach Festival), the origins of the Doll Festival are thought to stretch way back to the Heian period (794–1185). In imitation of a Chinese custom, on the first day of the snake in March (according to the Chinese zodiac), people would float paper images, substitutes for their children, in the river or sea and pray for their protection from accident and illness. 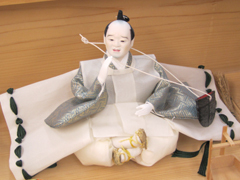 Over the centuries the element of warding off evil spirits dimmed, and by the Edo period (1603–1868) the festival had become a colorful event linked to the girlish custom of playing with dolls. Since Hina dolls are part and parcel of the Doll Festival, IHCSA Café visited the Ando Ningyo Ten (Ando Japanese Doll Shop) in Kyoto, which crafts handmade Hina dolls one by one and places immense importance on maintaining the traditions of Kyoto culture. While observing the production process, I asked about the characteristics of Kyo-Hina (“made in Kyoto”) dolls, the meticulousness of the master artisans, and their feelings toward the dolls. The main characteristics of Kyo-Hina dolls are the fact that they are all crafted by hand using high-quality domestic materials and the fact that there is a clear-cut division of labor, with each part of the doll being made by an expert artisan with high-level skills in making a certain part. The doll’s head is made by a head-making master, its hair is made by a hair-fixing master, its hands and feet are made by a hands- and feet-making master, and finally coordination of the whole, giving shape to the doll, is done by a dressing master. Usually when we talk about a doll maker, we mean the dressing master. 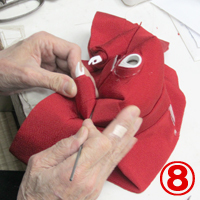 The Ando Japanese Doll Shop performs the work of a dressing master. 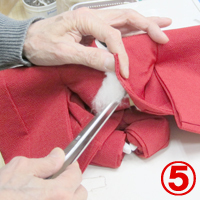 The dolls use specially made high-quality fabrics. 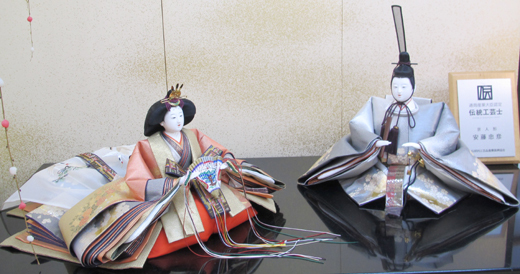 For example, the hair crafted by the hair-fixing master is 100% silk, and the kimonos fitted on the dolls by the dressing master come mainly from the famous Nishijin district of Kyoto. 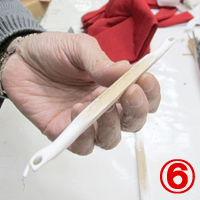 The production of each part demands well-honed skills and time-consuming work. For example, the making of the head involves more than a dozen processes. Among them, the process of painting the delicate white skin color through intermediate coating and final coating is a painstaking task, with the pigment being repeatedly applied, dried, and applied again five to ten times. 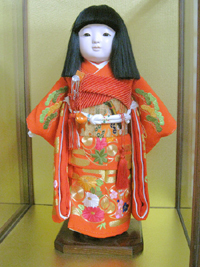 The kimonos of the Kyo-Hina dolls are faithful reproductions of traditional court costume. 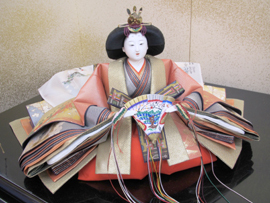 In particular, the male and female dolls at the top symbolize the emperor and empress, who resided in the Kyoto Imperial Palace before moving to Tokyo. The juni-hitoe (layered kimono) of the empress doll conveys the flamboyance of court culture, and its face exudes elegance and refinement. 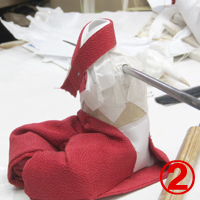 ① The process begins by attaching a neckline and legs to the doll’s torso, which is made of straw, and adjusting the hem of the hakama trouser-skirt. 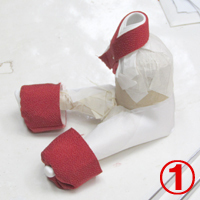 ② Next, the doll is dressed in a hakama, and the legs, which were stretched out in front, are folded. Also, an eyeleteer (a kind of gimlet) is used to pierce a hole sideways through the shoulders of the straw body. ③ Wire conforming to the size of the doll is passed through this hole, and the arms, packed with straw, are attached on the left and right. 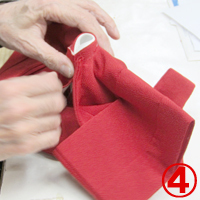 ④ The arms are then passed through the sleeves of a kimono, which is adjusted to match the doll’s neckline. At this stage, the arms of the doll are still stretched out. ⑤ Cotton is placed in necessary places in order to express the natural curves of the human body. The amount of cotton used is undecided; everything is left to the intuition of the dressing master. ⑥ The hands, which have been crafted by a hands- and feet-making master, are cut to the required length and attached to the wire extending from the arms. ⑦ The head, which has been diligently made by a head-making master, bears an inscription of the maker’s name on the neck. 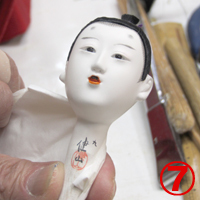 ⑧ The process of bending the doll’s arms, with hands attached, at the shoulder and elbow is called kainaori (arm bending). 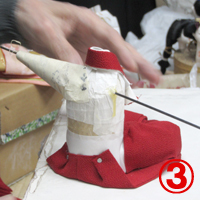 Since this arm bending expresses the doll’s delicate hand gesture, it is here that the dressing master really does display his skills. Indeed, it is said that you can tell who made a doll by looking at the way the arms are bent. Visitors to the Ando Japanese Doll Shop can have a doll fitting experience. 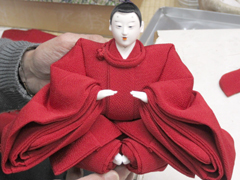 Making a Hina doll would be rather difficult in terms of both time and technique, so participants experience making an Ichimatsu doll, which represents a child and is relatively easy to dress. The experience takes from one and a half to two hours. After seeing the shop and workshop, participants listen to a talk by Keiho Ando on the history of dolls. They then select a costume, obi, and other items and, instructed by Keiho, dress a doll. After commemorative photos of the participants with their completed dolls, there is time for tea and questions and answers. For visitors from overseas, the shop will parcel the doll as carry-on baggage and deliver to their hotel by evening. This doll-making experience with traditional craftspeople is highly recommended for visitors who want a taste of the real McCoy. Keiho Ando has been designated as a “master of traditional crafts” by the minister of economy, trade, and industry and as an outstanding artisan of traditional industry by Kyoto Prefecture (“master craftsman of Kyoto”). 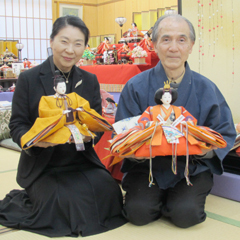 He is active in the promotion of the traditional craft of Hina dolls not only in Japan but overseas as well. In 2007 he presented Hina dolls to King Bhumibol Adulyadej of Thailand and then Premier Wen Jiabao of China.